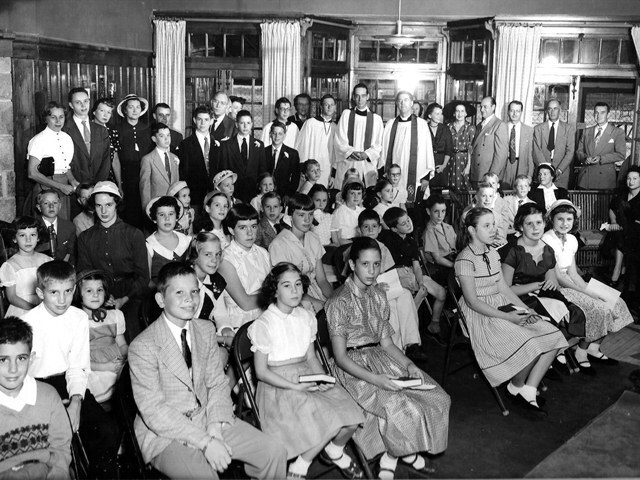 In May 1952, a small group of Episcopalians living in Ottawa Hills began meeting to discuss the need for a neighborhood Sunday School for children. Guided by the Holy Spirit and supported by nearby Trinity Church and St. Mark’s Church, they persevered enthusiastically and by September had rented the Toledo Tennis Club for Sunday mornings. Each Sunday, the locker room was cleverly transformed in to a worship space, including an altar that fit into one of the shower stalls. The tradition of having the children flower an Easter cross began in this location. One couple in particular, Hugh and Isabel Laughlin, played prominent roles in the first few years of this mission endeavor. 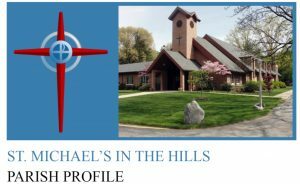 By December, the parishioners petitioned the Episcopal Diocese of Ohio to be organized as a Mission named St. Michael’s in the Hills. This was approved in January 1953. The name was selected because of the Gospel lesson from Matthew for St. Michael’s Day (Sept. 29) which reads, in part, “…except ye be converted and become as little children, ye shall not enter into the kingdom of heaven.” “In the Hills” was added to differentiate and locate the parish. The first Vicar, the Rev. Timothy Pickering, was appointed in May 1953 and served 14 years, a time of much activity for St. Michael’s. He returned to preach at the service celebrating the 50th Anniversary in 2002. A 10-acre wooded plot was acquired from the Canaday estate in November 1953 with an eye toward a future building. The purchase was financed by gifts from parish pioneers and a matching gift from the diocese. Six months later, as an interim step, a 15-room Georgian Colonial house on Bancroft Street was purchased, again made possible by generous donations and pledges. The house was used as the parish hall, the bedrooms as classrooms, and the garage as the chapel. This served for four years, although doubling services and classes each Sunday became necessary. It was in the basement of “the house on the hill” that the Echo Shop, a clothing consignment and thrift store was born. When the Shop closed in 2003, it had made monetary donations to numerous local, national, and international service agencies and had provided almost $443,000 for improvements to the church and rectory, as well as grants for clergy travel and education. Excess clothing was regularly donated to other churches and charitable agencies. Planning for the new church building began in 1955 and the dream was realized when the first phase of St. Michael’s in the Hills Church was dedicated in March 2, 1958. 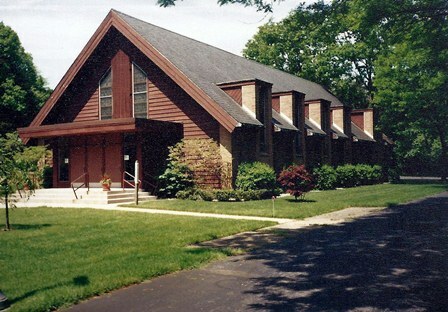 Additions and renovations in 1960, 1975, and 2002 provided a kitchen, classrooms, a Commons Room, an enclosed courtyard, a large Fellowship Hall, and a covered side entrance. In 1961 an adjoining plot was purchased for the rectory, which was completed in1963. St. Michael’s was made a full-fledged parish in 1959. The Memorial Garden, a secluded area of the grounds, was dedicated in 1976 and provides a hallowed place for the interment of ashes. Its entrance is a handsome lych gate and large stones provide the surface for the incised names of those resting there. The nave at St. Michael’s seats 250 and is adorned with stained glass windows that remind us of the symbols of our Christian faith: Saints Michael, Gabriel, Raphael, Peter, John, Thomas, Andrew, Luke, and John the Baptist; also the Crucifixion, the Resurrection, and the Sacraments. The Karl Wilhelm organ, dedicated in 1992 as part of the parish’s 40th anniversary, is a glorious focal point behind the altar. The case stands 24 feet high in the center; the organ has 24 stops and more than 1500 pipes. It is widely thought of as a “gem of an instrument.” Its acquisition was made possible by the encouragement of Kay and Paul Marion (the latter was organist and choirmaster for over 30 years) and the generosity of the parish. The nave seating consists of cathedral chairs which can be rearranged occasionally for special services, as on Maundy Thursday when the congregation shares a simple meal around a common table. Below each chair is a separate kneeler with an attached needlepointed cushion – a project completed by parishioners and friends in the 1950s and refreshed in 1984. Each cushion has a unique design and the symbolism is recorded (with photographs) in a book in the church’s archives. As with any congregation, St. Michael’s in the Hills had experienced periods of joy and sorrow, decline and renewal. One such period came in the early 1970s, when the parish mourned the unexpected deaths of two rectors and a curate, two of them seven weeks apart. A much anticipated building completion was suspended for several years at that time. At other times, corporate downsizing and relocations have caused loyal and generous families to move out of the area. Goals which sometimes appeared to be unreachable became challenges that motivated the congregation and were attained. Renewed vigor in the 1990s allowed for the 2002 addition to the building and, at the same time brought energy to the vision of the mission of the parish. Throughout its history, St. Michael’s has been blessed with clergy and laypeople who have provided guidance, leadership, and a strong faith to move the parish forward to Love, Learn, and Serve in Christ’s Name.